Beautiful red, deep purple and darkened vanilla are complemented by sweet vanilla musk and ripe fig fragrance. 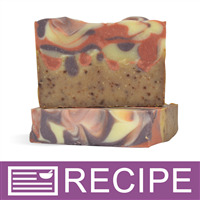 This creamy soap will help exfoliate and nourish dry winter skin. The fig powder also contains Vitamins A, B1, B2, and K and is thought to help refresh, brighten and protect the skin! INCI Ingredient Label: Water, Olive Oil, Palm Oil, Coconut Oil, Sodium Hydroxide, Safflower Oil, Shorea Butter, Fragrance, Fig Powder, Fluorphlogopite, Iron oxide, Mica, Titanium Dioxide, Tin Oxide. Measure out the Crimson Red Wine Mica Powder in the first funnel pitcher, the Chocolate Brown Mica Powder and Amethyst Purple Mica Powder into the second pitcher and leave the third pitcher empty. Add a small amount of the melted oils to each cup with mica powder and blend well using mini mixer. When the oils are around 100° F, you can add the lye mixture to the oils. Stick blend until incorporated. Into the second glass measuring bowl pour approximately half (20 oz.) of the batter. To this bowl add your fragrance oil and fig powder and stick blend until it has reached a light trace. Then remove the shaft of the stick blender and rinse clean. Pour the remaining batter evenly into the 3 funnel pitchers. Stick blend all 3 containers to fully incorporate the color and additives (mix from lightest color to darkest so the colors are not changed). 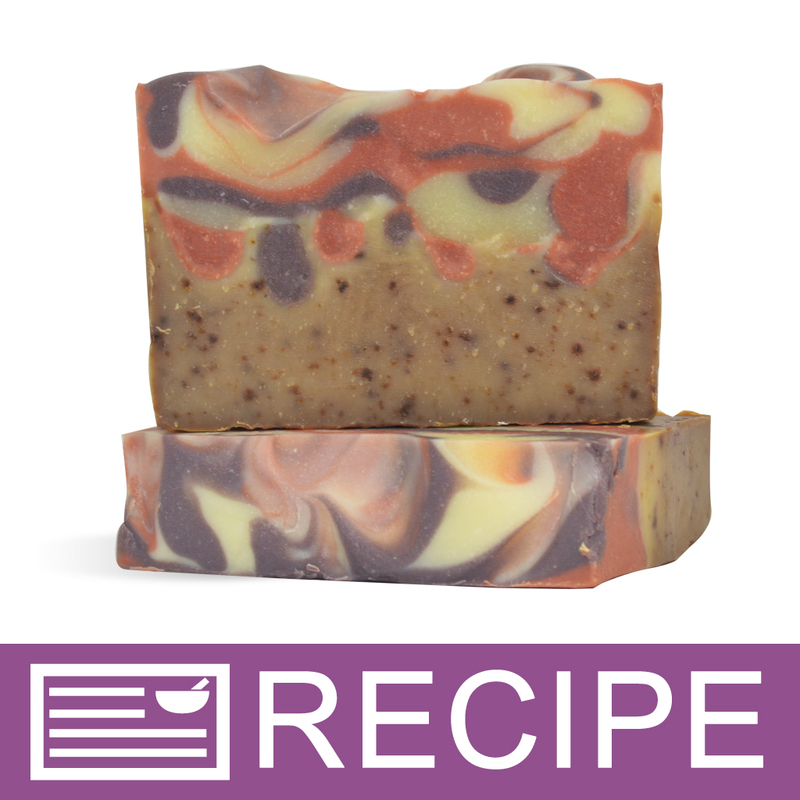 Pour the fragranced soap with fig powder into your mold. This should fill approximately half of the loaf mold. Then taking each color perform a “drop swirl” by pouring the colors in lines one after another and dropping the batter here and there. The batter may begin to thicken up which is okay. Keep pouring and repeat until all batter is used. Tap the mold on the counter to release any air bubbles. Texture the top as desired with a spoon or swirl it. Allow to set at least 24 hours or longer until soap is firm enough to unmold and cut.